What happens to black health care professionals in the new economy, where work is insecure and organizational resources are scarce? 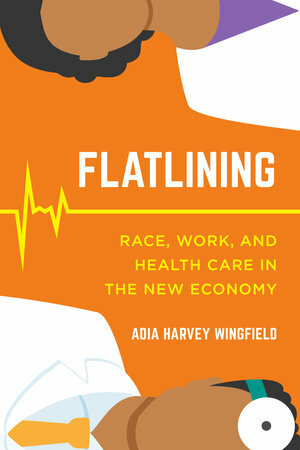 In Flatlining, Adia Harvey Wingfield exposes how hospitals, clinics, and other institutions participate in “racial outsourcing,” relying heavily on black doctors, nurses, technicians, and physician assistants to do “equity work”—extra labor that makes organizations and their services more accessible to communities of color. Wingfield argues that as these organizations become more profit driven, they come to depend on black health care professionals to perform equity work to serve increasingly diverse constituencies. Yet black workers often do this labor without recognition, compensation, or support. Operating at the intersection of work, race, gender, and class, Wingfield makes plain the challenges that black employees must overcome and reveals the complicated issues of inequality in today’s workplaces and communities. Adia Harvey Wingfield is Professor of Sociology at Washington University in St. Louis. She is a regular contributor to Slate, Harvard Business Review, and the Atlantic. Her previous book is No More Invisible Man: Race and Gender in Men's Work.